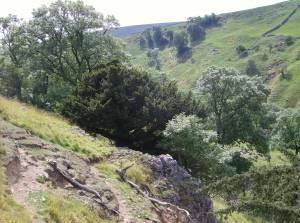 Location Throstle Gill. 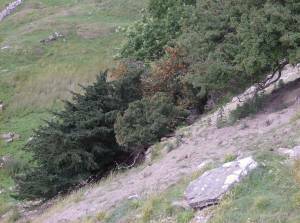 Limestone Scar on lower dale slope, 100m above east bank of stream. Geology Small cliff formed by the Underset Limestone. Record Name Throstle Gill Scar. 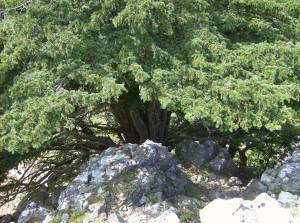 Specimen Yew with ash, wych elm, rowan, elder, hawthorn etc. Record Description This fine yew and the woodland community which also grows on this small cliff is characteristic of the many fine yews to be seen on the smaller and seldom visited or seen limestone scars of the North Bank Tributary streams of the Swale. Image 1 Description View of the Scar and yew from the north. Image 2 Description Detail of the base of the multi stemmed yew from above. Image 3 Description View of the Scar and yew from the south.